Just recently I’ve been re-evaluating the look and feel I want for my home. Where I’ve kept the styling quite elegant by using symmetrical and formal arrangements of prints and artwork on the walls, I’m not thinking about curating a more eclectic look to the decor. Symmetry has its place and I don’t think I’ll ever tire of the clean aesthetic it gives, it’s certainly the easier route, however, as I’m working on bringing more colour into my home, I’m thinking about creating a more casual feel with looser groupings with a cohesive style, maybe even bringing in more sculptural and textural wall art. All this lead to me doing a lot of pinning and then thinking that I might do a post on ways to hang your art. So here goes… my guide to expressing your creativity on your walls. Keeping on the straight and narrow Occasionally, you might choose to display a set of prints or photographs all in the same sized frames. For a more formal look that can work in traditional or modern settings, creating a row of prints or an even a couple of rows makes a statement and lends a ‘finished’ look to a room. Different sizes lined up against a top or bottom edge If you’ve got a collection of art in similar frames but of different sizes, one idea is to line them all up along one edge when hanging them. It’s more usual to line them up along the bottom edge but there’s no rule that says you have to. Becky used the picture rail as a guide when she hung these certificates and diplomas up in her study, aligning them along the top edge. Lining up along the bottom edge gives a similar look to these picture shelves which have the added bonus of flexibility – switch around the art to get a different feel seasonally or whenever the urge for change strikes! For a more casual and eclectic feel, why not bunch together a group of art in a random tessellating fashion on your wall. I love this look but it can be hard to pull off. My tip would be to unite your art one way or another. You could choose art in similar styles – a bunch of watercolours for example, or with a unifying colour theme. Provide interest by using a collection of different frames. However if your art has a more random feel, bring different styles together by using the same frames. I love Ribba frames from Ikea. in aluminium, classic black or white they come in a ton of different shapes ad sizes and are inexpensive. We used the black ones throughout our home. Symmetrical pairings In certain situations a pair of pictures looks like just the finishing touch you need. Over a console table, in a hallway, alcove or above a bed for example a pair of prints, flanked by 2 lamps give a pleasing formal look that suits period homes and bedrooms. Hanging a low piece over a piece of furniture. Sometimes the statement isn’t about making a group but about the position you hang a piece of art in. There’s no reason you can’t create the kind of vignette you see in magazine shoots and online but grouping a set of your decor elements together. A side table with a lamp and collection of books, backed by a low hung complimentary piece can give your home that styled look we often crave. A huge statement piece. A bold decorative choice can be hanging a single statement piece of artwork and it’s a look that I constantly admire in home tours you see in magazines and online. Image Credit: Miss Moss I think the hardest thing in this case is finding the right piece – with such a statement it has to be something you really love and often you need the right proportions or position in your home to be able to display it effectively. There’s no point putting something of a grand scale in a room where you can never really stand back and get the perspective to appreciate it. Small homes don’t necessarily need to avoid this look however, think of different perspectives like viewing the piece through a door way, in a mirror or looking down to a hallway from the landing for example. 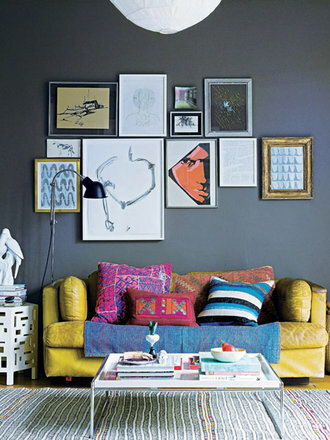 So, tell me what you prefer when it comes to wall displays and which images have inspired you here….